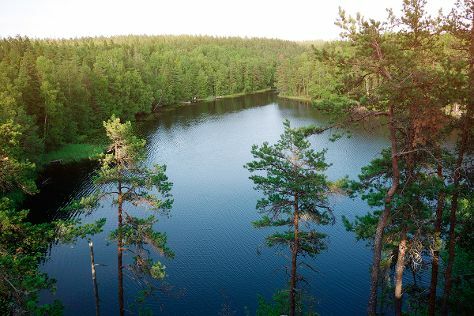 Go for a jaunt from Turku to Espoo to see Nuuksio National Park about 2 hours away. And it doesn't end there: get your game on at Moomin World, examine the collection at Luostarinmaki Handicrafts Museum, admire the masterpieces at Turku Art Museum, and explore the historical opulence of Turku Castle. To see traveler tips, reviews, other places to visit, and other tourist information, refer to the Turku trip itinerary builder website . Jyvaskyla to Turku is an approximately 4-hour car ride. You can also take a train; or do a combination of flight and train. Expect a daytime high around 20°C in June, and nighttime lows around 9°C. Wrap up your sightseeing on the 7th (Fri) to allow time to travel to Nagu. Start off your visit on the 8th (Sat): learn about all things military at Maritime Exhibition Sjofartshuset and then take in the architecture and atmosphere at Nagu Church. Inspirock's itinerary builder makes planning a Nagu trip simple and quick. Getting from Turku to Nagu by car takes about 1.5 hours. In June, daytime highs in Nagu are 20°C, while nighttime lows are 9°C. Wrap up your sightseeing by early afternoon on the 8th (Sat) to allow enough time to travel to Mariehamn. Mariehamn is the capital of Åland, an autonomous territory under Finnish sovereignty. Kick off your visit on the 9th (Sun): see the interesting displays at Museumship Pommern, then brush up on your military savvy at Aland Maritime Museum, then step off the mainland to explore Kobba Klintar, and finally test your team's savvy at popular escape rooms. Take the guesswork out of planning a Mariehamn vacation by using our trip itinerary maker. Explore your travel options from Nagu to Mariehamn with the Route module. In June, daytime highs in Mariehamn are 19°C, while nighttime lows are 10°C. Wrap up your sightseeing on the 9th (Sun) early enough to travel back home.